By the end of the 1980s, it seemed like every Australian soap star was releasing a pop record - Stefan Dennis, Jason Donovan and Craig McLachlan are probably the best-remembered examples. Kylie was still playing Charlene in Aussie soap Neighbours when she made her first record, The Locomotion, which was originally released only in Australia. The song was re-released in the rest of the globe as The Loco-Motion, and here in the UK it was her third top five single. Both of kylie's 1980s albums (the self-titled Kylie and Enjoy Yourself) were British chart-toppers, with all seven singles released from both albums reaching the UK top five. Who'd ever have thought that, over a quarter of a century later, she would still be releasing albums? No one would have predicted that Kylie would achieve success with 31 top ten hit singles in the UK alone. At the start, she was merely the puppet of Stock, Aitken and Waterman, and a song like "I Should Be So Lucky" was never going to be regarded as one the masterpieces of the 1980's. After several weeks of airplay, that song became more than slightly annoying for me! Nonetheless, it was the song that kick-started Kylie's very lucrative musical career here in the UK, and the singer still has a lot to thank S/A/W for, as without them she would never have had a successful pop music career. Here we see Kylie embracing 80s fashion by wearing a red ra-ra skirt on the cover of her single The Locomotion. Released in 1987, "I Should Be So Lucky" is probably Kylie's most-recognised 80s tune, although this bubblegum pop chart topper received very mixed reviews when it was released, with harsh criticism of both the lyrics and production. Je Ne Sais Pas Pourquoi was one of my favourite Kylie songs, and that's because it sounds more quirky and less irritating than the other S/A/W songs. The video depicts 1940s Paris, and Kylie has her hair in waves to depict the era's fashion. I particularly like the black and white scene where only Kylie herself is in colour and wearing a floral dress while dancing with a man in the streets. 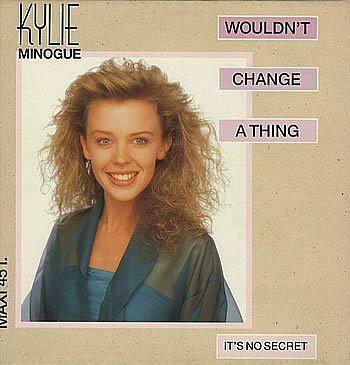 On the Australian version of the single Kylie is wearing that dress on the cover, but for the British sleeve (shown above) she's just wearing her typical eighties clothing. Wouldn't Change A Thing was the second single to be released from the album Enjoy Yourself by PWL, and followed Hand On My Heart which had topped the UK singles chart. Released on 24th July 1989, the dance-pop song performed well in the British and Australian charts, peaking at #2 and #6 respectively. However, the single became a more moderate hit in other countries, failing to break into the top ten anywhere in Europe. Tears On My Pillow was the final single to be released from Enjoy Yourself in January 1990 (Nov 1989 in Australia) and also featured on The Delinquents soundtrack, a film in which she starred. The Doo-Wop song was originally recorded in 1958 by Little Anthony And The Imperials and reached #4 in the U.S. Kylie's cover topped the UK singles chart in January 1990 and also reached #35 in Canada. During 2012, Kylie released a new album entitled Kylie: The Abbey Road Sessions. Produced by Steve Anderson, a full orchestra was used to recreate her hit songs. During 2014, Kylie released her Twelfth studio album Kiss Me Once along with three singles "Into The Blue", "I Was Gonna Cancel" and "Crystalize", with only "Into The Blue" becoming a major UK hit reaching #12. Kylie's 2012 Best Of album has a very 80s style sleeve with a stone-washed denim jacket covered in button badges. However, the compilation also features many hits from more recent decades including "Can't Get You Out Of My Head" and "Wow".